Christ Jesus, 6 who, being in the form of God, did not consider it robbery to be equal with God, 7 but made Himself of no reputation, taking the form of a bondservant, and coming in the likeness of men. 8 And being found in appearance as a man, He humbled Himself and became obedient to the point of death, even the death of the cross. There were some in the early church (perhaps early Bosco-ites?) who read this as meaning that Jesus only appeared to be a man – a heresy known as Docetism. But they were as wrong as Bosco is in insisting Jesus ‘is the Father’. It was in trying to understand these statements that the early Church developed the doctrine of the Trinity. But Jesus is also a made man, so in that sense He is lower than God; He is also not the Father, although the Father is God. Now, had Bosco taken the trouble to read, instead of mock, St Cyril of Alexandria, then he would not only not make claims which Jesus never made (He never says ‘I am the Father’), he would begin to know who Jesus is and be able to have a relationship with Him rather than whatever evil spirit has entered him. It does seem that this spirit which Bosco takes for Jesus has made him stop seeking. And if one does not seek then they remain in stasis, believing whatever it is that they have come to believe at the moment that paralysis occurred. The pilgrimage is not yet over, Bosco. Best be seeking as you move forward on the Way. I hope, possibly against hope, that Bosco will read and that the Holy Spirit will lead him to where he should be. Well, he’s now telling us that Jesus was just a man. That, of course, is the spirit of anti-Christ, as St John tells us. Sigh . . . I saw that. Whatever has a grip on his mind and soul is rather strong: this might require both fasting and prayer, I’m afraid. He is not reading – whatever possesses him will not let him. So sad to see such a case. He has not, of course, actually engaged with a single argument put to him. Geoffrey seems to have been right in his pessimism. However, we can only pray for Bosco – a lost soul at the moment. I agree: reason and facts are not effective at this point. Exasperating read, C. I must hand it to you for your valiant effort though. The Holy Spirit? I wonder what Pastor Steve had to say about Bosco’s theology, What does the leader, the shepherd of the flock say? and Why? We shall await with interest. Well, old Bosco is doing his usual nonsense – sad. Yes, but keep going, who knows? 28 You have heard Me say to you, ‘I am going away and coming back to you.’ If you loved Me, you would rejoice because I said,[a] ‘I am going to the Father,’ for My Father is greater than I.
Jesus was the Son of man. he shed his divinity to be born of a woman. Mary is the mother of a man. Of course god is greater than a man. Jesus wasnt glorified yet. So, you dare to say Jesus was not God. How then can someone not Divine save us? If Jesus is just a man, then any man’s sacrifice would have done. Bosco, whatever you are, you are as far from the real Jesus as you could be. That new spirit you have is a demon – you seem unable to understand this, and that demon is preventing you from coming to God,. Get him off your back and out of your life and seek God whilst he is still to be found. How many times have i said that Jesus is the creator. Its in the scriptures, and i believe every word. The Word was with god and the Word was god. How much plainer do you need it. You say i have a demon. When you get up off your knees from befor the graven image of Tammuz and read this, i wont expect an apology. You are entitled to your opinion. Oh, and dont stare too long at that golden sun symbol of Baal to long..you might become farsighted. You just told us Jesus was a man with God’s spirit in him – so make up your mind. The Word was with God because Father and Son, and Spirit, as of the same substance, but Father is not the same as Son – otherwise they’d be both called ‘Father’ Bosco. How much plainer do you need it? Your opinion is that of the antichrist. Try to find the real jesus Bosco, not the one you make up. If you cannot see that you are headed straight to hell-fire, others can. May God bring you His Spirit to replace the one in you now. Isaiah 9vs 6 says the child is the everlasting Father. If you dont buy that, well, theres nothing else i can do. So, you think that what St John says is cancelled out by what Isaiah says? As that cannot be, you are misreading both. Im misreading. Ok. lets see it….the everlasting Father…Ok…how do i misread that? Make it go away. You are misreading it. It does not say that Jesus is the Father; it says he is God. It says the child is the everlasting father. You are free to say it doesnt meanthat. 7 For many deceivers have gone out into the world who do not confess Jesus Christ as coming in the flesh. This is a deceiver and an antichrist. 8 Look to yourselves, that we[b] do not lose those things we worked for, but that we[c] may receive a full reward. If you do not believe that Jesus is the Incarnate God, the Bible calls you an antichrist Bosco. Repent of this sin and seek God. Bosco no where in scripture are we told that Jesus shed His divinity – He was as much God when on earth as before the incarnation and after it. You are not a teacher – this does not mean you are not a Christian as some are trying to make out here. Go and clear up these matters with the teachers at Calvary Chapel. Thank you good brother Rob for that excellent advise. I will do as you ask. Humans are lower than angels. There goes the mother of god thing. Mary gave birth to someone lower than the angels. Of course Jesus will sat his Father is greater. Bosco, before you comment, read. You now seem to be saying that you don’t think Jesus is God. For once, actually read both posts, think, and then comment. You are in the gip of some demon, and unless you at least try to know who Jesus is, you are lost. Ive read your posts, i repeat. So, tell me, was Jesus a fully-human person, or a puppet moved by God’s will, or something else? Pretty plain. Jesus said alot of things that the CC doesnt believe. No surprise there. Let me dig into the OT. The religious cant understand the NT. Try readng my posts Bosco, they address that question. You will not find any salvation Bosco unless you repent and find Jesus – the real one, not the demon who occupies you. I read both posts good brother Chalcedon. Thanks for creating them. Maybe someone will learn something. If whatever demon possesses you would let you, you could. Bosco, St John says plainly that he who denies that Jesus is God is antichrist – so by the Bible, you are confessing the views of antiChrist. When I tell you to pray and repent, and then do it until you see the truth, I am urging you to get on the path of salvation. I am not saying become a Catholic, I am saying become a Christian. Thanks good brother. Great advice. I shall. pretty plain. Beside the Lord, there is no god. Unless one doesnt believe the bible, the great I Am is saying that there is no other god besides himself. Of course there is only one God – who said otherwise? Your confusing chart you put up there does the double talking for you.. Jesus is god but not the Father. The father is god. Jesus is god but not the Father. Ive maintained this all along….religion turns a mans mind into malt-o-meal. Bosco what you are doing is diminishing God to the level of your understanding, or worse you have taken on a spirit of the anti-christ. I pray for you, for I know it was hard for me to be humble when I convinced myself that I knew it all. Bosco, if you re-read you will see the explanation. I read both twice. Human reasoning at its best, but still there is this pesky little Isaiah 9vs 6 that keeps singing in my ear. Maybe you can tell us how that verse isnt true. Youve already explaimned why its good to bow beor the works of mens hands and how lovely it is to call men father and how great it is to vainly repeat prayer. Yes, and your point? You need to think, not just cite verses. I provide you with reasons why this doesn’t mean ‘Jesus is the Father’ and tell you what it does mean. Fight that spirit in you Bosco, use prayer and anything else needed – but get away from whatever it is that is keeping you from Jesus. You are flip flopping Bosco, in your zeal to deny that veneration of Mary is proper and not against God you have denied the divinity of Jesus Christ. That does not bode well and by your own words these folks that you are saying ain’t saved are proving to you that what you are saying is not of God. You are flip flopping Bosco, in your zeal to deny that veneration of Mary is proper and not against God you have denied the divinity of Jesus Christ. My gosh, Good brother Iri, are you a sleep walker? You sound like youre asleep. In some dream state. How do i deny his divinity? Ive always said jesus was god. You religious people are in such a hurry to find fault with me, you will say anything. Not surprising. Religion turns a mans mind into apple sauce. You said a few moments ago that Jesus was a man – you cannot even recall your own words Bsco. From your own words (yeah I must cut and paste) “Jesus was the Son of man. he shed his divinity to be born of a woman. Mary is the mother of a man. Of course god is greater than a man. Jesus wasnt glorified yet.” That statement denies the divinity of Jesus Christ, Luke 1:41-44 should show you the error in your statement. No doubt when you have whatever Spirit is occupying Bosco, if has an effect on your short-term memory? hey, im going to go easy on you guys. You all agree jesus was fully god and man. This is hard to explain in human words. I cant do it. And it seems to confuse the unsaved even more. They let their wicked religion speak for them. I cut and paste scripture and you pharisees scream and contort even louder. Like a mad dog behind a fence when someone walks by. Scripture is plain, but never mind scripture..youve got pedophiles in Dagon fish hats to guide you. And a cathechism that trumps the bible. You can run Bosco, but you can’t hide. Seems god , the Father, is also the redeemer. We are redeemed by the blood of Him who died on the Cross. Do you think the Father died on the Cross Bosco? Read both posts and pray for understanding. It is sad to see a good man moving so far from Jesus. So, you will use the OT to deny the New. Just show me where Jesus says “I am the Father’. I do not think you have read what I have written Bosco. St John says those who say Jesus is not divine are antichrist. That seems to be you Bosco. How does it feel to be in the grip of antichrist. Get saved Bosco. The above quote is from Isaiah. God is talking directly. he says the child to be born will be called the everlasting father. What else do you need good brother?..Oh, thats rite, you dont believe one gat danged word of scripture. And that explains how Jesus can be both Father and Son? No, it explains that Jesus is God, but not the Father. No, it explains that Jesus is God, but not the Father. So 9 vs 6 says hes the everelasting Father, but good brother Chalcedon says its not true. Not surprising, for someone who uses graven images to direct their prayer. Where does Isaiah say Jesus is the Father? He doesn’t, he says that God is the Father and the Son. Learn to understand what you read Bosco. If ya read the Scriptures and prayed instead of being Captain cut and paste ya might understand and place it in proper context. Whats wrong with letting the Lord of hosts do battle for me.? You religious people comdem me and scream louder when i paste straight from the bible. Good brother Chalceon is beside himself , calling me demon possessed. I do little talking. I let scripture talk for me. You missed my point all together, even the devil can quote scripture, yet you refuse to see wher you contradicted yourself and denied the divinity of Jesus Christ. A deeper study of Scripture would reveal to you that the things you have been stating are wrong. No, Bosco, you speak for Scripture and in place of it, and as St John shows, you speak against it. Whatever demon spirit is occupying you, it is keeping you from Jesus. My advice is that you need help. aLLMANNER OF SIN WILL BE FORGIVEN MEN. bUT NOT BLASPHEMY AGAINST THE HOLY GHOST. And whilst we are on the subject of the Spirit, Bosco, what is the relationship of the Spirit to the Father and the Son? And can you give me the Scriptural definition of that Bosco??? The Son is not the Father, and Jesus does not say He is the Father,. Isaiah is referring to God, who, of course, is Father, Son and Holy Spirit – that is what Is. 9:6 means. Now, answer my question Bosco,. When Jesus walked this earth, did he have a mind and a will of his own, or was he like a puppet controlled by God? Jesus said it was the Father that acts thru him. His mind was the Fathers. But, the NT is closed to the unsaved. No, where does he say his mind is that of the Father? Is Jesus a puppet in your view? In which case, Bosco, Jesus is not human, so he can’t die in place of us. good brother Chalcedon, do what i did. Try brandy instead of whiskey. One doesnt get way out there. Bosco, well if this is what you are doing! it might explain the nature of the ‘spirit’ which inspires you. 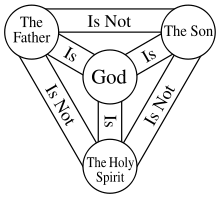 Bosco GOD (YHWH) is our father therefor that includes Jesus but this is not the same as the relationship of FATHER, SON & HOLY SPIRIT within the Trinity. That’s why Jesus said He was going to ‘My Father and your father’. He did not say going to ‘our Father’ – the relationship is different. Dang good brother Rob… youre out in left field too? Proper context. Thats how the Jews explain away how god condemned them, and why they are the suffering servant. Any passage you show them, they say its taken out of context. Easy to let those words rattle out of your mouth. But the Words of god will not go away. Indeed they will not Bosco – and in the words of St John they condemn you. Bosco, you just got caught with your non-Trinitarian pants down. Stop digging. Its talking about the child, Jesus, who, is god. But good brother Chalcedon is in such a mad dash to besmirch me, he says its not talking about Jesus when plainly it is. Now you sadusees can continue to say im demon posessed. Over to you. Is he Bosco? He is writing about the Messiah, who is the Son and with the Father, is God. Look out Bosco, you are at one time saying that the child Jesus ain’t God and then you are saying that He is God. If the child Jesus ain’t God then how come the Scripture that you are quoting says that He is. My advise to you is to do a little reading about trintarianism and bow out until you get right with the Holy Spirit. My gosh, good brother Iri is on LSD also. ? So that I might understand, Bosco. Are you saying that Jesus is Father, Jesus is Son and Jesus is the Holy Spirit? If so, then to be Baptized in the name of all three persons is simply a case of redundancy and one could use any of the three names and we would be Baptized just the same? Seems a strange thing to ask the Apostles to do to folk. They are all one. Even you religious people know that. But i dont understand why you all insist they are separated by an impassible wall. No one is saying that. When you acquire the Spirit of Truth these things will be revealed to you. Good brother Servus, i guess one could baptize in any of the three names. But baptism is to show ones faith in Jesus, in particular. It doesnt save one like the devilish CC likes to tell its devotees. Otherwise one of us might sit next to good brother Hitler at the wedding feast. Strange then why Christ would tell his Apostles to do it if it is only a sign that shows one’s faith in Jesus. Surely, Christ and the believer already know this, don’t they? Or is it kinda like pushing a peanut across the floor with your nose as a Fraternity hazing – to show the frat brothers that you really do want to be a brother of theirs? Sure thing good brother Servus.Just between you and me….a ritual wont make one born again. Its a thing between you and Christ. Alone in your room with the door closed. It might be pertinent to this (conversation?). Each is referred to as a ‘persona’ this does not mean a separate person in the same sense that Rob, Bosco and C: are separate persons and entirely separate beings. What it does mean is that each of the ‘persons of the Trinity’ has His own specific and unique personality and characteristics e.g. 1)	The Father is not begotten or sent and does not have a body, The Father does not have an image, God has an image. 3)	The Spirit proceeds from the Father Jn. 14:15-17 and was poured out on the church by the Son Acts 2:33. The manifestation of the Holy Spirit bring the direct activity of God into current human situations. The Spirit is spoken of as thirst quenching water Jn. 7:37-39 appeared as a dove at Jesus baptism and in flames of fire at Pentecost and yet is also a person spoken of with personal pronouns and is described with personal characteristics being a comforter one who can be both grieved and lied to. So each is God but do not share all the same characteristics, therefore the Father is not the Son or Spirit, the Son is not the Father of Spirit and the Spirit is neither the Father or the Son. The Son incarnate was both fully divine and fully human. Jesus has a human soul, mind, will and emotions. But He did not live out of those human faculties independent of the will of God. In the Garden prior to the crucifixion we clearly see that Jesus had a will distinct from that of the Father’s because he said to the Father “Yet not my will but yours be done”. The words Jesus spoke were those he heard from the Father and the works He did were those He saw the Father doing Jn. 14:10. The Son of God Jesus performed these works by the power of the Holy Spirit following His anointing with the Spirit at His Baptism by John. Jesus having emptied Himself and taking the form of a servant Philippians 2:7, 2Cor. 8:9 did not perform His miraculous works out of His own divine power but in the power of the Holy Spirit Lk. 4:18 & Acts 10:38. So we see the activity of the Trinity in each action. Jesus modeled for us how as believers we may also see what the Father is doing and do the same sort of works by the power of the Holy Spirit Jn. 14: 12-14. You happen to be correct good brother Rob. When the Lord appeared to Abram in the heat of the day, he showed up as three people. That is unlikely Bosco two of the three that appeared to Abraham were angels read the following chapter – If what you say were the case it would make nonsense of scripture and imply that the Holy Spirit and the Father both have bodily images. But scripture tells us ‘no man has seen God at any time” the only begoten has made Him known”. What you are saying about all three persons bearing a human image is what the Mormons teach it is an error. Er eh, help me out here….isnt God the father? So do I Bosco. So does Rob. So why do we agree and both think you are in error? Bosco – I mentioned this on the first post, But who was Jesus praying to in the Garden, Himself?, he was sweating blood while holding a conversation with who? Why are we to told to say the Lord’s prayer, with its selection of nouns? The demon who sits at your table and sups with you is not your friend nor your savior. They split into 3 persons when they want. Dont ask me how or why. Good brother Tom, Jesus saw sweating blood because all the sins of mankind were being laid on him. In medical terms, its sever anxiety. people are known to do that under the worst conditions thinkable. Jesus was praying to the Father. No Bosco they do split into 3 persons when they want. That is the error called ‘Modalism’. God exist in His very being in 3 eternal Persona God is Father Son and Holy Spirit – not just splitting as and when as you describe. 0 Ye are my witnesses, saith the LORD, and my servant whom I have chosen: that ye may know and believe me, and understand that I am he: before me there was no God formed, neither shall there be after me. God knows of no one else but himself. He alone is the savior. There is no other. And, Bosco, God is a Trinity – Father, Son and Holy Ghost. That was the almighty god talking there, and he says he is the Savior and there is none else besides him. He makes that kinda plain my good brother. Of course, no one denies it. But the Father and the Holy Spirit were not crucified for our sins, neither did they die on the Cross and rise again; only the Son did that. Very true C: but Bosco need to also understand that the whole Trinity is involved in various ways in each act of God. God talks about himself and the Redeemer as one person, in the singular. And yet in the New Testament, Jesus talks of Father, Son and Holy Ghost. Me, I’m with Jesus. If you think Isaiah contradicts Jesus (and I don’t) the who are you to believe? No one is saying there is more than one God, Bosco. 7 And the residue thereof he maketh a god, even his graven image: he falleth down unto it, and worshippeth it, and prayeth unto it, and saith, Deliver me; for thou art my god. All who make graven images and bow befor them are as dumb as the graven image itself. You will see the words ‘worshippeth’ and ‘prayeth’ there Bosco. As you keep being told it is these things, not images as such, to which God objects. Are you guys getting this? There is only the Lord, and there is none else. Bosco, you are ranting again. No one says there is more than one God. There is One God in three persons. Yes you are correct but that LORD YHWH is revealed to us in the NT as the Father and as the Son. The one and only God of Israel is himself the Savior. 1 Tell ye, and bring them near; yea, let them take counsel together: who hath declared this from ancient time? who hath told it from that time? have not I the LORD? and there is no God else beside me; a just God and a Saviour; there is none beside me. Bosco, are you OK? No one has said there is more than one God. You did, and Good brother Servus did, and good brother Rob did and on and on. God begs to differ. He alone is the Savior. That makes Jesus the Almight God, and there is none else. No we didn’t. We said there is one God in three persons, Father, Son and Holy Ghost. Bosco lets take another angle. Can you please explain to us what or who you think the Holy Spirit is? Bosco, as no one has claimed there is more than one God, you can stop imitating a Muslim. Not so fast bucko. You have been saying im demon possessed because i think Jesus is the father. Im showing scripture that says that the Lord God of Israel himself is the Savior and there is none else but him. Stay tuned for more bad news. No, you are not showing that Jesus is the Father. Jesus is the Son, not once does he say ‘I am the Father’. He prays to the Father, the Father is greater than him. The bad news, Bosco, is that if you do not believe in the Trinity, you are a pagan. I ain’t said that you were demon possessed, I am saying that you are blinded to the truth by your pride, that you are reducing God to the level of your understanding and are refusing to consider that maybe Bosco could be wrong. The scripture says to test the spirit and it looks like you ain’t testing the spirit, you are saying in your pride “That is what I thought, them heathens and idolaters ain’t got common sense.” You need to get with somebody you trust and study the Scriptures. Who died on the Cross, Bosco? The father or the son? The Son of man died on the cross. And that was Jesus, the Son. Yet you insist Jesus was the Father. You see how confused you are? And I will feed them that oppress thee with their own flesh; and they shall be drunken with their own blood, as with sweet wine: and all flesh shall know that I the LORD am thy Savior and thy Redeemer, the mighty One of Jacob. The Almighty God is the redeemed and Savior. No one said otherwise. We just said that it was not the Father who died on the Cross. Thats funny, God says a zillion times that he is the redeemer, and there is none else. The Almighty God died on that cross, or tree. No one said He didn’t. Jesus is God, the Father is God and the Holy Spirit is God. One God, Father Son and Holy Ghost. But Jesus is the Son, not, as you keep insisting, the Father. The verses you have quoted say that the LORD alone is the redeemer the word used consistently for LORD in the OT in capital letters id YHWH i.e. the divine name the ‘I Am’ in the OT it is applied to God not specifically to the Father. The understanding of God as Father Son and Holy Spirit cannot be clearly defined from the OT alone – through the NT revelation we find that the ‘I Am’ is applied directly to Jesus – so establishing conclusively that Jesus is God. Also and we also find that the Holy Spirit is a person not just some inanimate force applied by God. Yes if you have the Son you have the Father also. None of which says the Jesus is the father. Good brother Rob, where did you learn to split hairs? Youre really good at it. So is good brother Chalcedon. Bosco: I learnt it refuting cults and winning them to Jesus, it’s called rightly handling the word of truth – look it up! Its kinda hot out in the sun here. Weve been having a heat wave for the last month. What’s the temp Good old California I have spent 2 holidays there attended a Calvary Chapel on another occasion spent 6 weeks in Modesto preaching 6 nights a week in 6 different churches. Here the temperature is always about 30 night and day.